1. Put the butter, xylitol, vanilla extract, cocoa powder, coffee granules and water into a saucepan. Heat it gently, stirring all the time, until the butter melts and the mixture turns into a sauce. 2. Take the saucepan off the heat. Add the oats and stir the mixture until it has thoroughly combined. 3. Line a 13 cm (5 inch) square container with a double layer of cling film. Press the flapjack mixture into the container with the help of a spoon or spatula. Turn the excess cling film over the flapjack mixture and put a lid on the container. Place the container in a refrigerator overnight. 4. 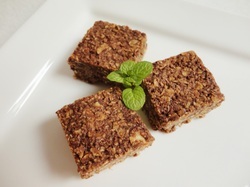 Cut the flapjack block into 8 bars or 16 mini squares. To avoid dairy, lactose and casein as well as to make the treat vegan, use non-dairy vegetable margarine instead of butter.